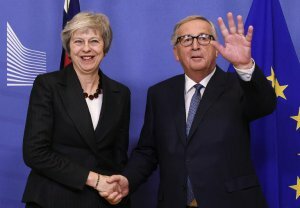 The EU and Britain on Thursday agreed a draft declaration laying out plans for ‘ambitious, broad, deep and flexible’ relations after Brexit, setting the stage for the divorce to be finalised at a weekend summit. The EU Council President Donald Tusk said the 26-page declaration, outlining how Britain will work with the bloc on trade, security, the environment and other issues, had been agreed ‘in principle’ and would now be sent to the remaining 27 member states for approval. The pound leapt by about 1% against the dollar and also firmed against the euro on news of the declaration. Britain’s embattled Prime Minister Theresa May hopes the declaration will convince sceptical lawmakers to approve her vision for the UK’s departure from the bloc. She is to make a statement to parliament later in the day, presumably to sell MPs the deal, which she hailed on the steps of 10 Downing Street. ‘This is the right deal for the UK,’ she said after updating her cabinet on the text. A special summit of all 28 EU leaders to sign the final Brexit deal is planned for Sunday, with May set to travel to Brussels the night before to finalise preparations. First, the texts must be cleared by a meeting of top EU diplomats – the summit’s so-called ‘sherpas’ – on Friday. While the declaration has no legal weight, May will hope that ardent Brexiteers will be appeased by references to Britain developing ‘an independent trade policy’ and spelling out an end to free movement of citizens between the EU and UK – two of the key demands of the Leave campaign. She has been under intense pressure from all sides over the withdrawal deal, with a slew of ministers resigning in protest and some of her own party MPs launching a bid– stalled for now – to unseat her. Northern Ireland’s Democratic Unionist Party (DUP), on whom May’s Conservatives depend for their majority, has been flexing its muscles, fearing that efforts to avoid a hard border with Ireland will lead to the province drifting apart from the rest of the UK. ‘I have just sent to EU27 a draft Political Declaration on the Future Relationship between EU and UK,’ Tusk, who represents the 27 remaining EU member countries, tweeted. He said EU leaders still have to endorse the draft declaration, which is due to accompany a draft of agreed terms for Britain’s withdrawal from the bloc on 29 March. In an update of the withdrawal agreement, both sides have agreed that the post-Brexit transition period may be extended from its current end date of 31 December 2020 ‘for up to one or two years’. The transition period is designed to allow governments and businesses to adjust to a new relationship after more than four decades of close ties. But the declaration does not deal with the vexed issues of fishing and Gibraltar, the British territory that sits on an outcrop of southern Spain. Madrid wants a veto over applying any agreement on post-transition relations to Gibraltar, while some EU countries including France have voiced concerns about access to British fishing waters after Brexit. European Commission spokesman Margaritis Schinas told reporters the two issues “still need to be addressed and resolved”. On Wednesday Spanish Prime Minister Pedro Sanchez repeated a threat to sink the whole Brexit deal if Madrid’s concerns on Gibraltar were not met. In London, a spokesman said Thursday that May ‘will shortly be updating cabinet on the state of the negotiations’. May was due to host Austrian Chancellor Sebastian Kurz, current holder of the rotating EU presidency, for talks at Downing Street. She was then expected to address the House of Commons, in a statement focused on progress in EU negotiations, at around 3:00 pm (UK time) parliamentary officials said.